I had to take the car in yesterday to have the brackets holding the exhaust system welded back on. I knew it would take some time so I needed to bring something to do while I waited. I thought about the stack of magazines. I thought about the book that sits on the dresser. Then I decided the stitching took priority. I'd like to get this done so it can be framed for the recipient. It was the perfect thing to do while I waited. My friend, Doo, quipped to my Facebook post about getting the brackets done, "What? You don't use coat hangers like everyone else?" I quipped back, "Well, the only hangers I have are plastic and I keep having a problem with heat..." My mechanic thought that was pretty funny. He said he had better coat hangers they would use. It took a good 2 hours to do the welding. 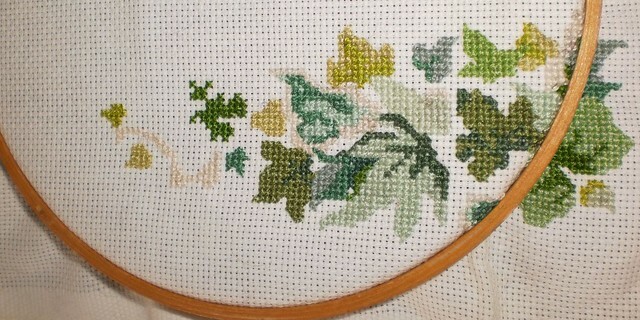 I was able to get 5 leaves and two partial leaves done. This is the end of this side of leaves. Once I finish these two partials, I'll turn the piece and start stitching the other direction. And the Jeep? Well now I can actually sneak up on people again. You don't hear me coming or going.